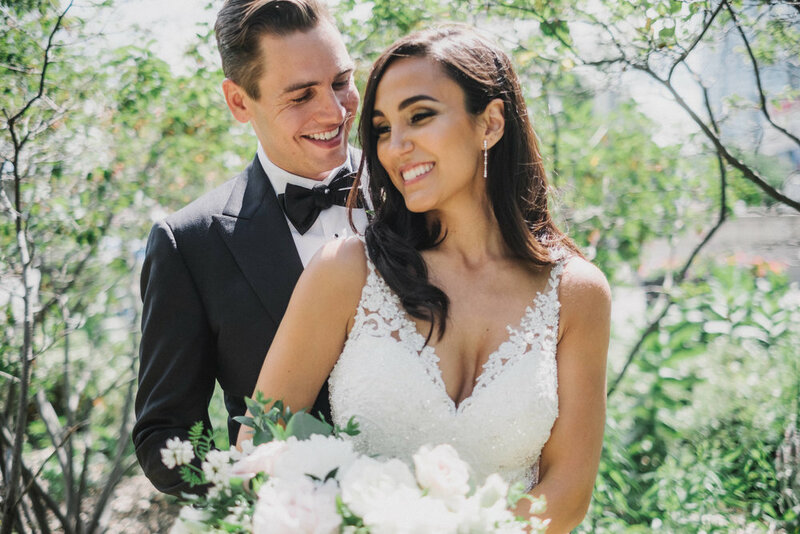 Gabriella & Nick's wedding at The Arlington Estate was one of soft blushes, whites and greenery to subtly accent the newly opened venue and all of it's stunning details. With picturesque settings and no detail overlooked, guests were in for a wonderful evening to celebrate the lovely couple! 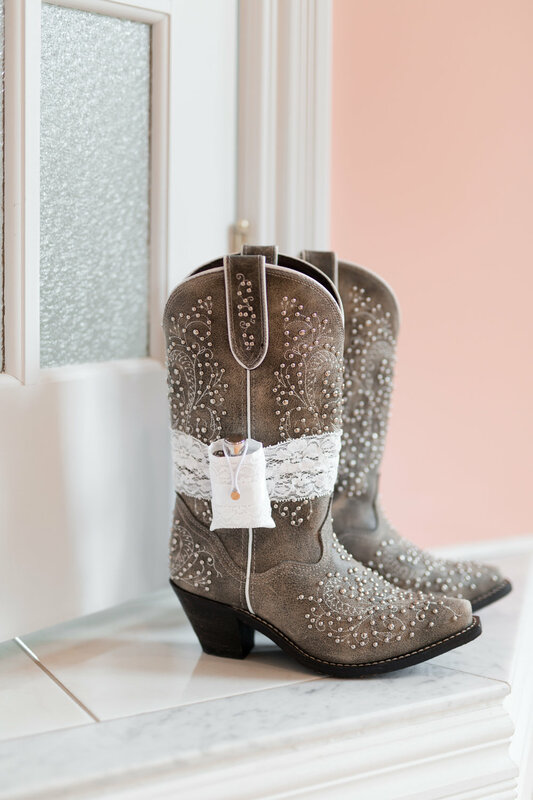 One of our favourite details from the day was the bride's blush dress that she wore with her studded cowgirl boots (she's an aspiring country singer). 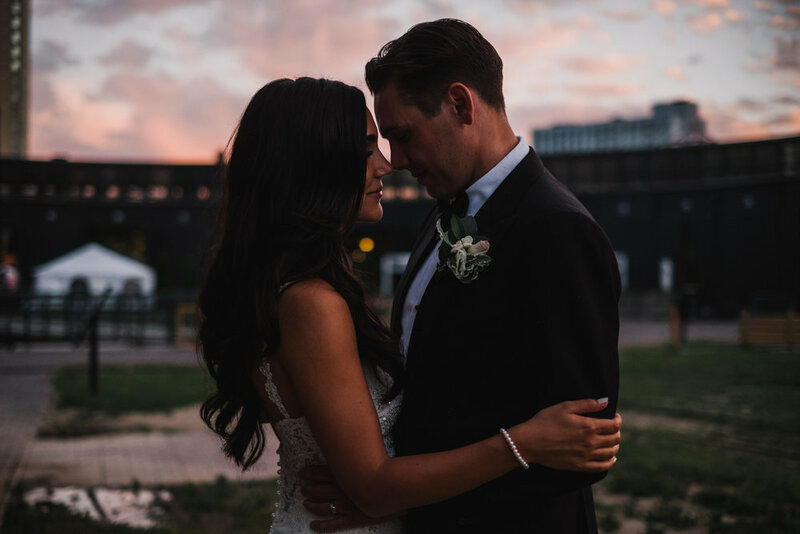 There was just a ton of personality and love poured into the planning of this day and are thrilled to share some photos with you! 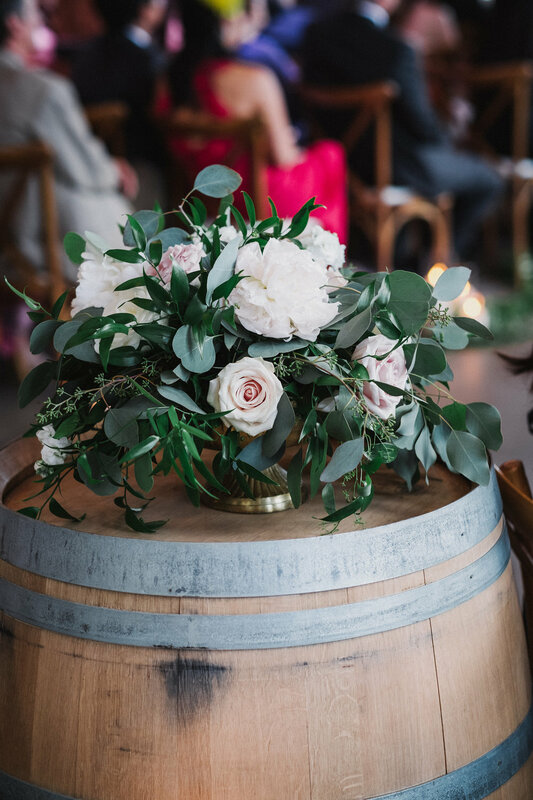 Working with Amanda and Michael for their wedding flowers was completely effortless. They knew what they wanted and went for it! 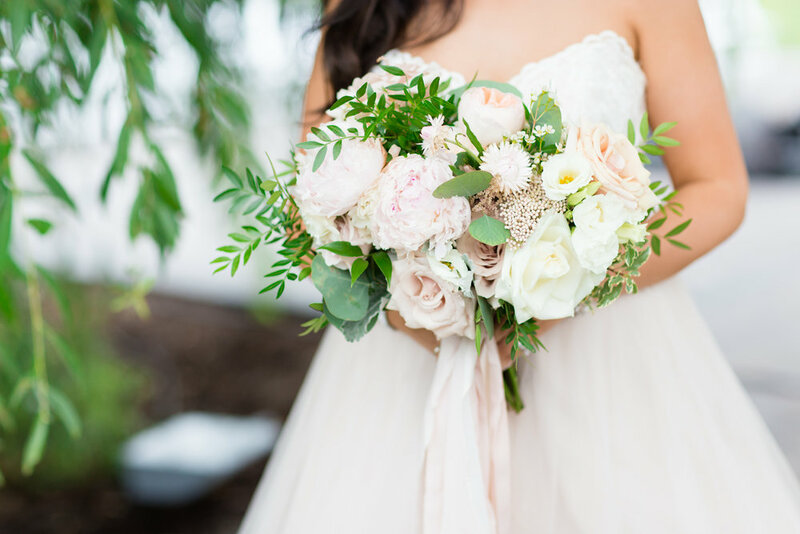 We loved getting to work with seasonal peonies, lots of greenery, and other flowers in white and blush tones. 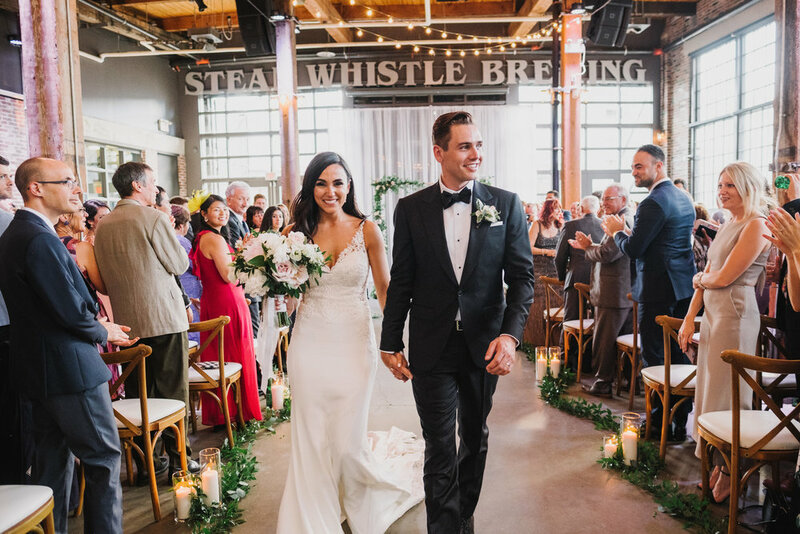 The juxtaposition of the garden flowers and soft colour palette worked well against the industrial vibe of their wedding venue, Steam Whistle Brewery, with it all being set up to perfection by the team at Blush & Bowties. Congratulations Amanda & Michael! 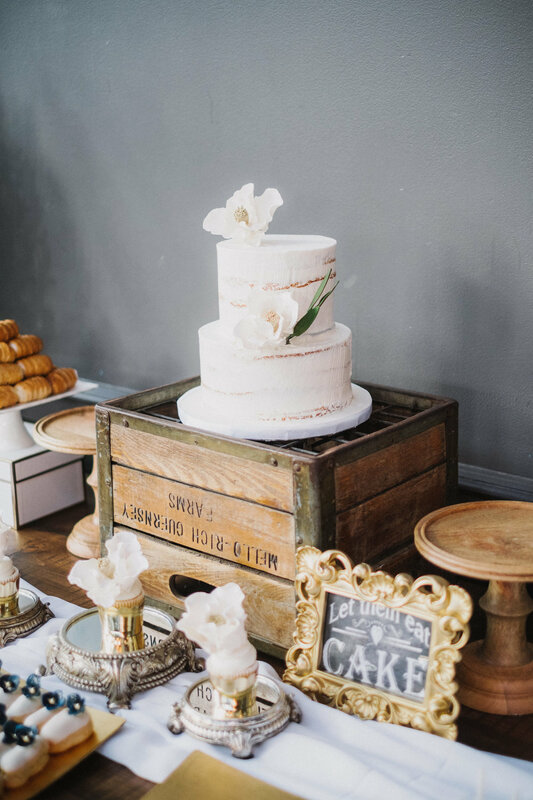 Chrysta & Derek's wedding was held at The Doctor's House in Kleinburg, ON in June 2016. 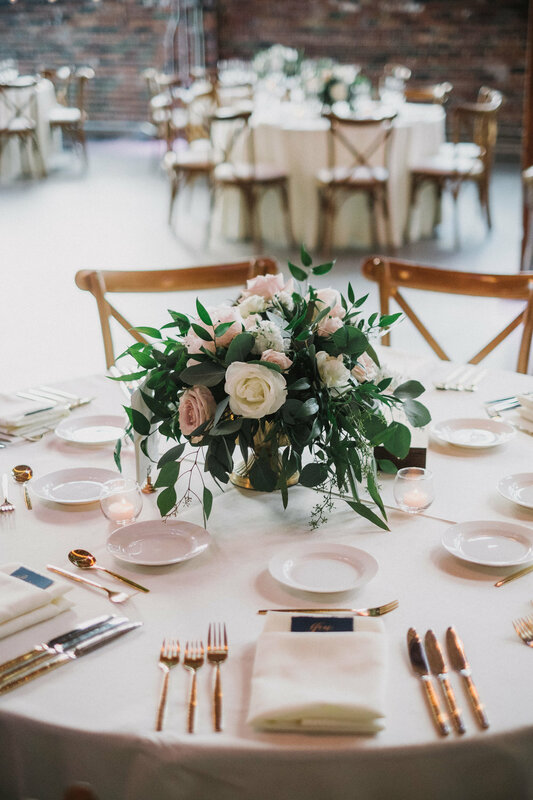 When we first sat down to discuss the design for the wedding, Chrysta knew she wanted a blush and rose gold affair to create a really romantic atmosphere, with lots of fluffy flowers and minimal greenery. 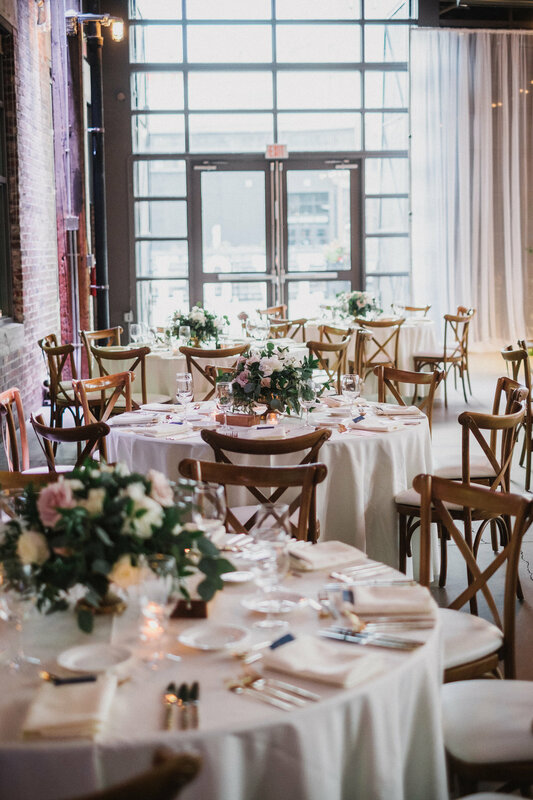 This couple was one of our full service clients - meaning we planned, designed, coordinated the entire wedding celebration + created the fresh flowers. We take on a select few weddings like this each season so that we can be deeply involved with the final outcome. We had a lot of creative freedom to bring their vision to life and we're really happy with how the day turned out! Since their celebration was in the beginning of June, which is technically late spring, we opted to create a spring garden inside of the reception room. Centrepieces were varied between blooming manzanita branches and full flower compotes. All of the accent metallics were rose gold, seen in the table numbers, stationary, and candle holders. We rented a blush linen with intricate lace overlay on the head table to further soften the room from Around The Table. The Doctor's House has beautiful gardens and large windows throughout their room, so creating that garden vibe was all that much easier by allowing the venue to be a focal point in the celebration. 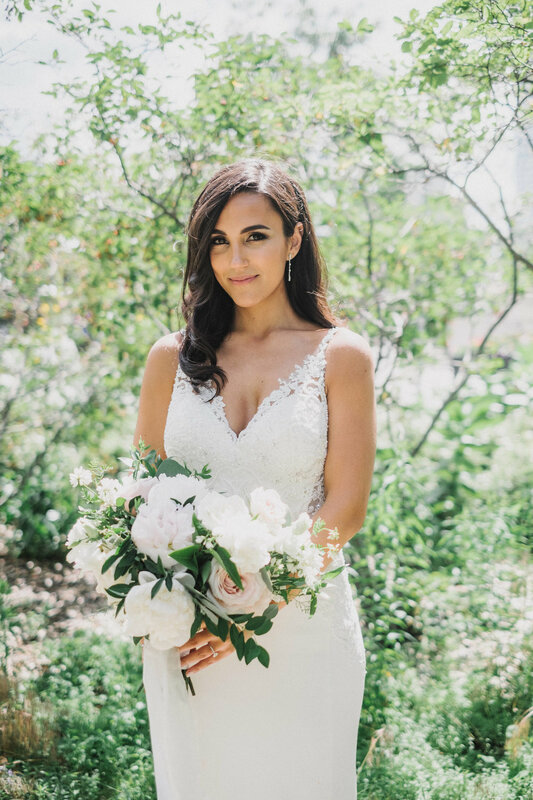 The white chapel on the property was where the ceremony was held, further enhancing their guests' experience because every wedding event flowed easily into the next and it was all captured so beautifully by Nicole from Crimson Photos and James from SevenSeas Productions. Congratulations Chrysta & Derek! I was over-the-moon excited to recently find out that a bouquet I had designed in 2015 was selected as one of "The 50 Best Spring Wedding Bouquets" on Martha Stewart Weddings! I mean, Martha-freakin'-Stewart! I'm still unsure how this happened, but hey, I'm pretty happy about it. It took me back to when I first met the couple of that wedding, Katherine & Anthony. It was in 2014 and I had just begun to expand my services to include fresh flowers (I began as a planner / coordinator in the industry). Katherine really took to my ideas and designs and was such a pleasure to work with (we are still friends today)! She wholeheartedly let me design and plan their wedding to the best of my creative abilities at the time. I distinctly remember during the planning process that I kept telling myself - "give this your all", "go above and beyond", "you-do-you", "standard of excellence"...things I tell myself on a regular basis because I truly believe that what you put out there, will come back to you tenfold (positive or negative). The work and heart that went into K & A's wedding has resulted in such an outpouring of blessings for me, I cannot even begin to list them. This recent accolade, along with a few others I received for this specific wedding, validates my belief that hard work and smart work result in long-term success. 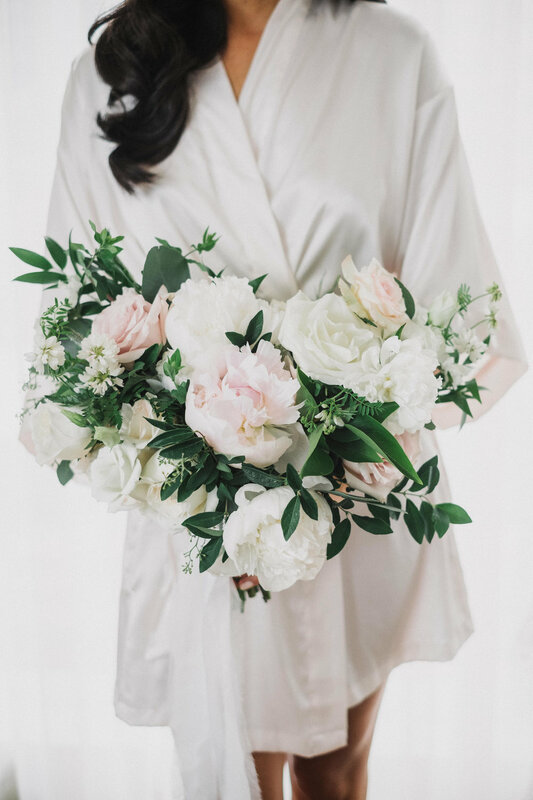 Even though when I look at this bouquet now, I see various things I would maybe do differently, I can't shake the feel-good-vibes that I accomplished so much with this wedding in my first season of exploring and expanding my business. Typical me that I should title my blog post "a year of firsts" since this is my first blog post. I consider myself the household comedienne (despite the lack of enthusiasm from my husband, James), but the title truly reflects what this post (and series of posts) will be about - my first year as a full time #bosslady. Hopefully, sharing my experiences, as I navigate through the ups and downs of this journey, will impart some wisdom, entice some feedback and hopefully illicit laughter from those of you who read this. I am by no means an expert writer or vastly successful in what it is that I now do (wedding florist / stylist), but I know I've read a TON of blogs and connecting to the heart of other business owners, particularly other #bossladies, has helped me get to where I want to go. So, with all that said, I hope you join me on this journey of newbie blogger / full time boss(y) lady and see where it takes us. Okay, so yes, I left the comfort of a secure, full-time-salary-plus-benefits job that I loved to finally pursue my business full time at the end of February 2017. This was a very difficult decision to make, but I was burning the candle at both ends all of 2016; trying to fulfill my responsibilities as a manager in my job and to my clients in my business. This culminated with burn out, exhaustion, weeks-long pneumonia and resting orders from my doctor in January 2017. It was during this time that I made peace with the decision to finally take the leap and resign from my job. Surprisingly, it wasn't as terrifying a thought as it used to be. Perhaps it was the prescription meds or the exhaustion, but I was actually eager to leave. Even though I didn't have everything quite figured out (and still don't), I had the entire support I needed of James, my family and I just knew in my heart that God will provide; He always has. This doesn't mean I don't expect challenges and adjustments, but I was really tired of feeling like I lived a double life: manager extraordinaire by day, wedding florist and stylist by night and on weekends. Not living fully on purpose was making me sick - physically, mentally, emotionally. I was miserable and I'm pretty sure I was making everyone around me miserable too! So, with some new courage and excitement in my heart, my last day of #joblife was Friday, February 24, 2017! Freedom, living with intention, living with authenticity, pursuing my dreams on my terms, etc, etc...all the typical things I read and think about were now happening for ME. Whoa. And the best part about it all? Aside from the support of family, friends and community, it was happening for me because of ME. I believed in myself enough now to take the leap. I believed I was good enough to live a life that meant something. I believed I could, so I did. What are some firsts that you've recently experienced? How do you handle changes in your life and lifestyle? What are some firsts that have really impacted your life? For many, the first of anything can be terrifying, but how you use that experience to make a positive impact on your life or the lives of others will determine if you get that second, third or fourth opportunity. I would love to hear more about your firsts throughout this series!